A voice from the past calls us into the future. A journey begins with a simple yet profound ceremony. We lift our eyes to the hills ahead of us. Those intimidating mounds must be crossed. We realize that our help comes not from the thrill of hill climbing but from God, the maker of the hills, the guide along our journey (Psalm 121). I have begun a professional academic program at the Anderson University School of Theology. In four years, I will earn a Doctor of Ministry degree (see these preliminary thoughts). My DMin degree is an applied degree that will be intimately tied to the life of Mt. Haley Church of God. The program culminates in a “professional project” in which we will work together to address a ministry-related issue in the life of the church. For three weeks a year, I will be in Anderson for intensive classes with the eight other students in my cohort. The first of those weeks is taking place right now. I want to share with you a wonderfully meaningful event that took place at the end of the seminary’s chapel service this past Tuesday. All of the new DMin students (including me) and new master’s degree students were asked to come forward and kneel at the chapel’s altar rails. The faculty and other mentors anointed us and prayed God’s blessing on our upcoming journeys. And then we were given a small, silver cross. Take a close look at this image. Look at the date and the signature. This was signed on September 2, 2003 by Dr. Gilbert Stafford, one of my mentors and seminary professors. (Dr. Stafford was pastor of East Ashman Church of God in Midland prior to his time as seminary professor in Anderson.) He was endlessly enthusiastic and deeply theological; he inspired, challenged, and transformed his students in remarkable ways. He was a writer, a thinker, a discussion partner, and a worship leader. 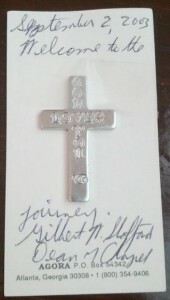 And he prepared small, silver crosses like this to give to incoming students at the beginning of their time in the seminary. Dr. Stafford died of bone cancer in 2008. I was working on my Master of Divinity degree in Anderson then. Just recently, the seminary’s leaders discovered these signed crosses in a long-forgotten file and decided to give them to this year’s incoming students, including me. Where were you on September 2, 2003? I was beginning my second year of math studies at Miami University in Oxford, Ohio. I was 23 years old and was not married. I had not yet begun seminary studies, let alone service as a pastor. Somehow, across the years, my life keeps intersecting with Dr. Stafford’s life in meaningful ways. I can only hope that my ministry intersects with his just as meaningfully. A voice from the past calls us into the future. A journey begins with a simple yet profound ceremony. Stand on the shoulders of yesterday’s giants. Can you see what the future holds?